Boil the potatoes and mash it. Take a bowl, put mashed potatoes into it. Add salt, sugar, lemon juice, green chillies and garam masala and mix it well. Take a chappati and put it on the plate. Apply the mixture on half part of it. Now fold the remaining half part on it and press it with light hands. It will be in semi-circle shape. See that the mixture is not applied till the edge otherwise it will come out while frying. Apply on the other chappatis the same way. Take a flat frying pan and add little oil. Don't take too much oil as we have to shallow fry it. Fry it till it is light brown. 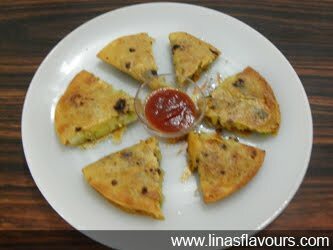 Cut into small triangle pieces and serve it with tomato ketchup.